The Ohio State burst through the gate in the fourth quarter with a big play on the offense and then one on the defense to pull away from the michigan Wolverines with a 42-28 win at the Horseshoe in Columbus. Ezekiel Elliott's 44 yard run on fourth and one gave the Buckeyes a 14 point lead and Darron Lee added a 33 yard scoop and rumble to finish off the visitors late in the game. Elliott finished with 121 yards rushing and two scores for Ohio State. The big loss was to quarterback J.T. Barrett in the third quarter to a broken ankle to end the season for the Texan in what might prove to be the final crushing loss in a season marred by injury. Ohio State finished the season at 11-1 and completed an undefeated season in the conference at 8-0. 1) J.T. Barrett out for the season and that is a huge loss. Cardale Jones has ability and I'm not ready to concede an automatic loss to the Badgers or anyone else,but Jones is definitely an unknown. 2) Has any team ever lost two Heisman Trophy candidates at any position let alone quarterback in one season? I'm not saying it hasn't happened,but I can't recall it. 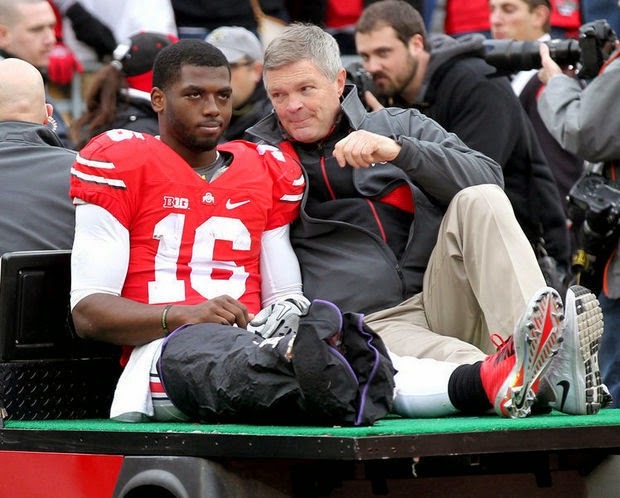 3) J.T Barrett had ran for two scores and thrown for another one before the ankle injury. Barrett's three scores set a Big Ten record for touchdowns in a season at 45 breaking the record set by Drew Brees at Purdue. 4) Huge play with fourth and one at their 44 leading by seven to go for it and then have Ezekiel Elliott run for the score. 5) Elliott ran 17 times for his yards against the Wolverines,but I'd bet that he will run at least 25 times vs Wisconsin. Cardale Jones can run,but he is more a Terrelle Pryor runner than a Braxton Miller or J.T.Barrett,the Buckeyes just might become a power running team vs the Badgers. 6) Joey Bosa has been great all year,but he jumped offsides and cost OSU a turnover (they would score on the drive) and his ripping off a helmet of a michigan runner may have been funny,but it cost 15 yards and allowed a drive to continue. 7) Defense will need to step up next week after an iffy performance to a pretty bad offense. 8) Devin Gardner may not be a very good quarterback (although he played well enough vs the Buckeyes),but he showed huge sportsmanship by coming out to talk to the injured J.T. Barrett. 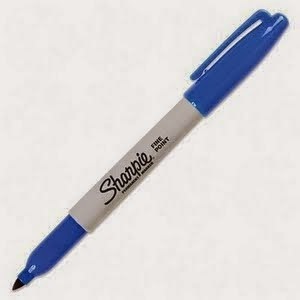 9) Well,since this might be my last note to Brady Hoke,who looks to be out the door-I'll make it a good one. From your crybaby attitude to your disrespect towards OSU and beyond-It's been nice beating you around the last few years. 10) Going to be tough against Wisconsin. Those games are usually toe to toe combat anyway and with a team that struggles to stop the run against the best runner in the nation (Melvin Gordon),this was a pickem game,but without J.T. Barrett? The Boxing Challenge with R.L. Malpica continued with five bouts and at the end,I pulled into a tie with R.L at 75 points after earning seven points to his six on the weekend. We both earned two points for Ruslan Provodnikov's KO of Jose Luis Castillo and two more for Terrence Crawford's unanimous win over Ray Beltran. I thought Crawford won comfortably 119-109 on my card. Neither of us would earn points for Evgeny Gradovich's IBF Featherweight title retaining draw against Jayson Velez. 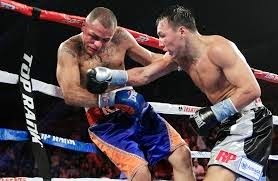 I was surprised by the draw as I had Gradovich winning 116-112. The difference in points came from two bouts from London. R.L. earned two points for Tyson Fury's stoppage of Derrek Chisora after the corner ended it after round 10,I would only get one for Fury's win having picked him by unanimous decision. I would tie the season though with a Billy Joe Saunders split decision win over Chris Eubank Jr.
Saunders gave me two points while R.L. picked Eubank and got zero. My card had Saunders ahead 115-113. With just a month to go,it will be a race to the wire. 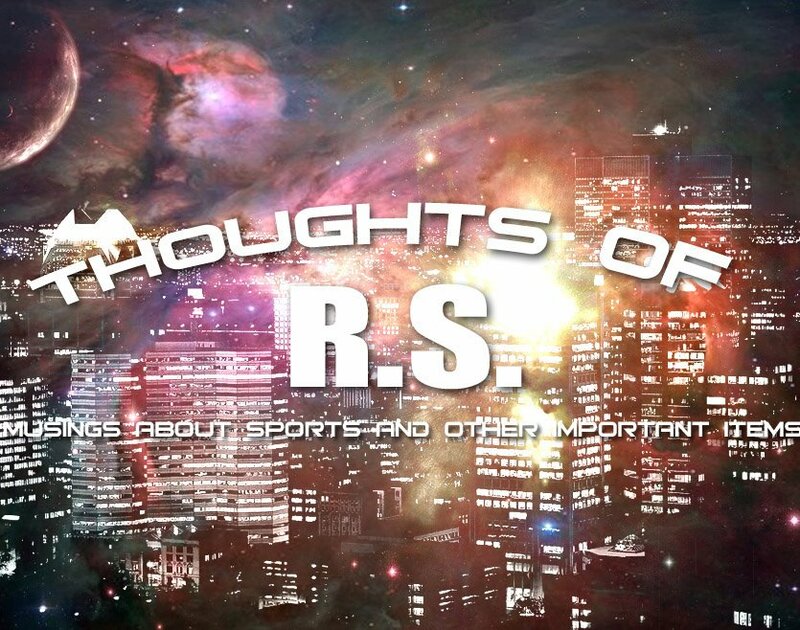 I have Buckeyes and Browns recaps to do,so I hope to get those done sometime tonight or tomorrow! I will be back later today with a Boxing Challenge update,but I'll be doing a Ohio State update later if not tomorrow. The Cavaliers whipped Indiana,but I didn't watch,so no review there. I'm pretty tired and I'm just hoping to get through the Browns game,so the boxing challenge requires less time! The New Jersey Devils lost their fourth game in a row,this time to the New York Islanders 3-1 at the beautiful Nassau Coliseum..
1) Give the Devils credit in this one-they were trying. They played hard and outshot the Islanders 16-2 in the final period. One of the two Islander shots were the empty net. I was encouraged by the effort although moral victories don't add standings points..
2) The Devils did have a five on three chance late in the game and the Devils didn't take advantage of it. 3) The Islanders game winner was just a fluke as the puck was redirected off a skate and by Cory Schneider. Bad breaks happen and they often happen at the worst time..
4) Damien Brunner was in the lineup after injuries to Adam Henrique and Travis Zajac and the results were mixed. Brunner did score the only goal and put four shots on net,but he took two frustrating penalties and he still tends to disappear,but today he was able to level the good with the bad. 5) Cory Schneider once again played both ends of the back to back and his inability to find the puck allowed the Islanders to score their first goal. The Devils were criticized through the years about using Martin Brodeur to the point of exhaustion. The New Jersey Devils played very well for a period and a minute as they built a 4-1 lead against the visiting Detroit Red Wings. Devils goals to Mike Cammalleri (9 and 10 both power play),Jaromir Jagt (4) and Peter Harrold (1). 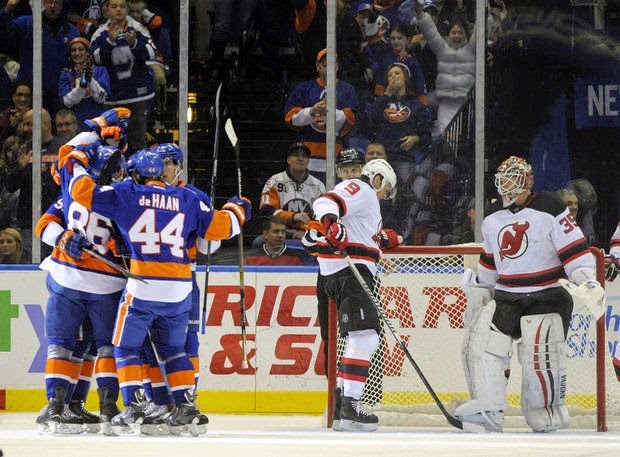 The Devils are back tonight against the surprising Islanders. 1) I was excited to be back in hockey mode after missing all three Canadian games,but this loss was a tough pill to get down. As soon as things get bad,the Devils start to question things and the loss becomes a self-fulfilling prophecy. 2) Things might be getting worse for New Jersey with losses of Travis Zajac and Adam Henrique. Cammalleri is able to hit the open net and is the best sniper that this team has had since Zach Parise at minimum. Now,lets hope he can stay healthy! 4) This team was built on defense,yet no one seems to cover the slot! How many times this season are we going to see Marek Zidlicky allow someone in slot to hit an open net or least an unguarded shot,while Zidlicky stands by doing nothing. Zidlicky isn't the only one,(Andy Greene also did this in the loss),but it sure seems to happen to him often! 6) The Devils still almost won this game in overtime when a shot went over and around the Detroit goaltender Petr Mrazek but not into the goal. Mrazek even turned like he expected to see the puck in the net! 7) Still frustrated with this. I'm watching point opportunities go away,coaches being befuddled and players (some) that have begun to accept losing. The Boxing Challenge continues with R.L.Malpica holding a one point lead (69-68) over your humble author..
Billy Joe Saunders vs Chris Eubank Jr.
We have to get started a bit early this week with Friday games-so here goes! 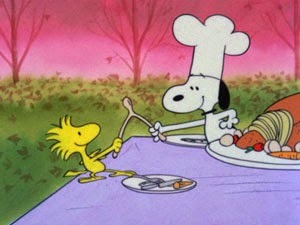 First off.let me wish all of you a Happy Thanksgiving and I hope you all enjoyed it in your own personal manner. Thanksgiving is my favorite holiday as it has no religious connotations and no matter your belief,religion or even lack thereof,there is something (or many things) that we all can be thankful for. On to the inbox for a little cleaning out. We start with a retirement of an icon as the Kennedy Space Center has retired the huge countdown clock that it has used since 1969's second Apollo mission to the moon and up until the final space shuttle mission. The six foot tall clock has been shown in every space countdown for television and in several movies. The clock has been outside for that span of time and weather takes its toll on all mechanical workings,especially over 45 years of them. Parts had become difficult to come by for repairs and its time had come. Fox Business anchor Melissa Francis claims that she was silenced by former employer CNBC when she wanted to broadcast her thoughts on "Obamacare",which she wanted to state that the numbers didn't add up. Francis works for a pretty conservative network,so keep that in mind,but I do wonder if NBC and its satellite networks,which are known for being very liberally base,might have done this or at least kept Francis from being in a position to state her views. The former Harvard graduate knows the issue and I tend to at least believe her numbers are accurate at minimum. I'm not a financial wizard or anything,although I do watch Francis's show in the afternoon and find it interesting,but I do wish that some of the networks would consider a straight up reporting aspect rather than biases-from either side. We wrote about the weeding out of the fighters in the NHL recently and Grantland did the same on the topic. I've always had a soft spot for Georgia Southern football since I read an article in the early 1980's about their starting a football program at a time where you didn't see that every day. Combine that with my fondness for their first head coach in the colorful Erk Russell and the Eagles were my favorite 1-AA team along with Youngstown State. Georgia Southern dumped Florida last year at the Swamp and this year in their first season in 1-A football,the Eagles are on their way to winning the Sun Belt title. Sadly,despite this,the NCAA doesn't allow teams moving up from 1-AA to go to bowls for two years after the move up the ladder. Georgia Southern has appealed after their strong season,but I wouldn't bet on the NCAA changing his mind. Grantland looks at the Georgia Southern program here. The Grey Cup is this Sunday with the Hamilton Tiger-Cats against the Calgary Stampeders. I've written before about my appreciation for the Canadian game,but checking the previews for the Cup,noted NFL writer Peter King traveled to Canada in June for the first time and offered quite a few thoughts and notes on the CFL. The Grey Cup can be seen on ESPN2 at six o'clock Sunday night and I'd highly recommend giving it a try. That cleans the inbox for now. Back tomorrow night with the Devils return home against the Detroit Red Wings. LeBron James scored 29 points and grabbed 10 rebounds to gain some revenge against the Washington Wizards for an early season whipping in the Cleveland Cavaliers 113-87 win in Cleveland. Kevin Love scored 21 points with Kyrie Irving adding 18 for the back to .500 at 7-7 Cavaliers. 1) LeBron James set the tone in this one as he drove to the basket repeatedly in the first quarter and set the intensity level at high. Clearly the dominant player and James showed the Wizards that there was not be another version of the game in Washington. 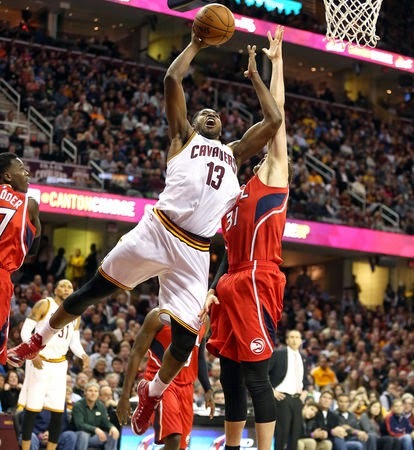 2) Kyrie Irving had problems with John Wall in Washington,but he sure didn't in Cleveland. 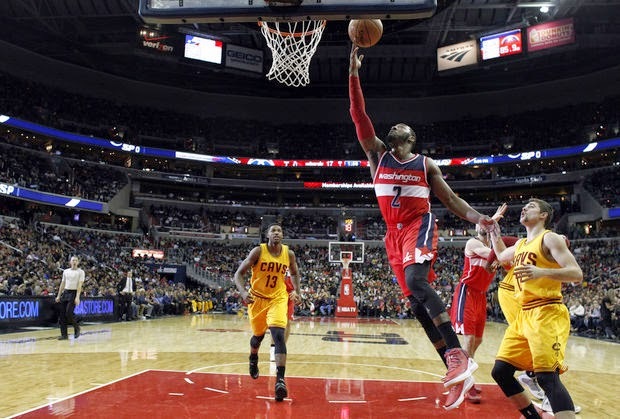 John Wall ripped the Cavaliers last week,but he would only make two field goals in this game. That wasn't all Kyrie Irving on defense as he had some help,but Irving picked his defense up and didn't allow Wall to get comfortable in the rhythm of the game. Everything seemed forced for Wall and the numbers reflected that..
3) Dion Waiters did score 17 points off the bench,but he did it with a bad shooting night-6 of 17 . This is deceiving because of the blowout,but when Dion Waiters is first in shot attempts,rarely a good idea. 4) Anderson Varejao hit all five shots and continued a good offensive run of late..
On a team that features him as a 4th option at best,if the Cavaliers get that kind of shooting,this team is going score of ton of points..
5) John Wall and Tristan Thompson had a little pushing battle that saw each earn technical fouls. The game tries to crack down on this stuff,but it still exists and I think that's a good thing. A world that,for the first time,made me see that the day of it being just the lovely Cherie and I is coming. I'm not running from that world,I've never had that kind of time with my wife,but change is coming and nothing you might try to deter that change will work. You look back at things and realize that the little girl is now a beautiful woman and you'll never be the top man in her life again. Oh,you may make the occasional chart in rough times,but if times are good ( and if you are a good parent,one hopes so),you should settle into the number two role or even lower in some cases. But,it wouldn't be human,if we didn't want to reach back and try to possess things as remember what things once were. The temptation is to grab the reigns and hold things back,but that's futile and self-motivated to try. It's always a mistake and far more often than not,we make that error. You'll never command that type of attention again and I don't think we should,but reflection and memories are all you have of both that young girl and the person that I was. You might be the person that she comes to when the chips are down and there is a role for that,but that means that you are the person to help in a bad situation that is needed. Think of it as a kitchen uni-tasker in a cooking dilemma! Like a spent star,I'm ready to take my place in the new world,whether its today or years down the road and it's not a bad thing. 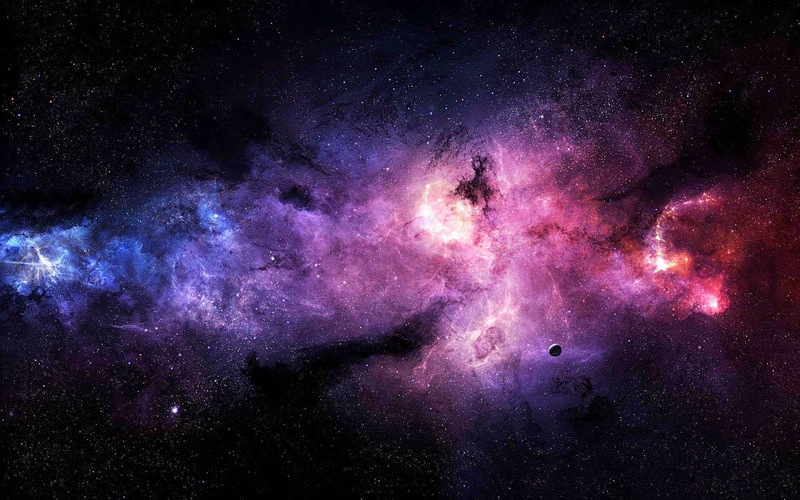 I'm not sure how things eventually go,but perhaps a day is coming with me becoming a planetary nebula is on its way with a small center yet having everything scattered around you. ready when needed like a guard stationed alone at a remote post. Could prayers be answered? Fredericksburg deal falls apart! A little over an hour before I left for the road office tonight amid the wonderful forecast for snow,I saw the logo for the Hagerstown Suns and the upcoming 35th anniversary season. I really like the logo and two things drew me in for a closer perusal. The first was that you can almost (and sometimes can if I move slightly) see where my seats are under the grandstand. However,the second was more important-35 years and counting. Kinda of odd from a team and its owner that has spent the last two plus seasons aching to move away with their public pronouncements and spending money like Jack Benny used to,so I checked the Google search that I do every week or two and found this link that Google said had been put up just fifty minutes before. Apparently,Bruce Quinn and Diamond Nation have had a parting of the ways and the city of Fredericksburg will not be getting the Suns. The county of Spotsylvania is mentioned in the article as being interested,but the talks would have to start over,the site would have to be spotted well as the Richmond Flying Squirrels could block any move that is 50 miles from their field-the Diamond and I doubt that they would have the funding in order any better than the city of Fredericksburg. The Suns have apparently decided to swing the pendulum all the way to the other end as they are going to have a season long celebration with giveaways and promotions "during every homestand",just one season after the least promotionally active campaign that I'm aware of anywhere-not just Hagerstown. This is a good thing and I applaud them for giving this a try. The team is now here through 2016 and who knows the status of Bruce Quinn after losing a ton of money over the last few seasons. Could Quinn have a deal to sell the team to a local group in Hagerstown and just is waiting to announce it? Could Quinn have decided to throw himself into Hagerstown and see if a turnaround is likely? That will be tough after the burn it to the ground policy of Quinn's tenure,but the grass eventually grows back after it's been burnt away. If the team is here for two seasons guaranteed,that means another election and perhaps another chance to talk with the ballot box for a council that will back the team with the old argument of facilities. One thing among all the uncertainties that I can say for sure is this-It's been a long time since the news on the Suns has been this good off the field! 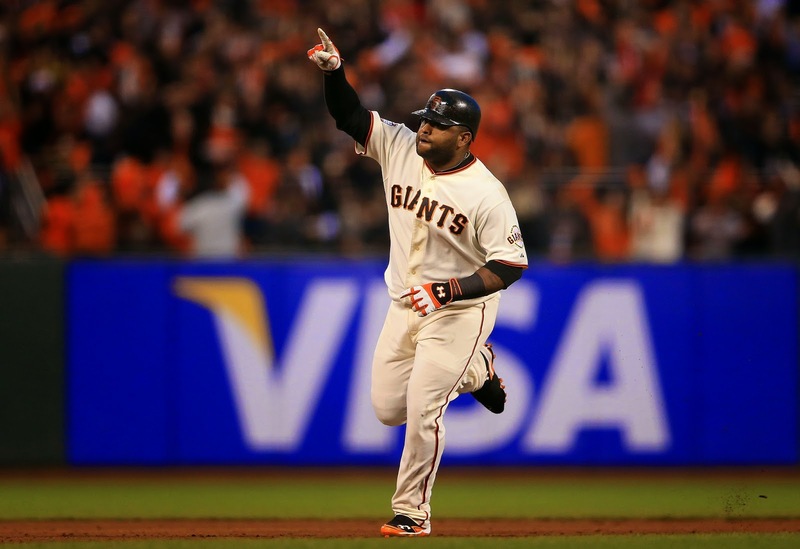 The San Francisco Giants thought that they had a chance to re-sign Pablo Sandoval after the post-season. Turns out that the free spending Boston Red Sox had other things in mind as New York lite signed the Giants third baseman away with a five year deal (6th year on an option) worth 95 million dollars. Now I'm not going to complain too much about the spending-if you really care,go back and read this from four years ago-nothing's changed,so I'll instead discuss what the Giants need to do and a little about the Panda that Boston bought in their latest trip to the carnival. The Red Sox had a gaping hole at third base and Sandoval is a good fit there-for now. Five years at that cost is a hefty amount for a player with weight issues,injury problems (although none in the last two seasons) and for a player that looks like part of a power hitter,doesn't have the production of such,although the move from AT&T Park to Fenway might solve some of that. An underrated defender,Sandoval will be fine at third for a few years until he may eat his way off the position and for the Red Sox talk of Sandoval transitioning to David Ortiz's DH spot after Ortiz retires,I'm not sure if that's a sure thing either. Players of Sandoval's size and plate discipline tend to flame out fast and that could happen here. I think Sandoval is a fine player and could fare very well in Boston,but this is a contract that does have its risks for the Red Sox. Meanwhile for the Giants,a huge loss as now a team that was already looking for improvement in left field and a starter for the rotation and has added third base as a must need. The Giants are going to have to do something about third base and other than maybe Chase Headley,there isn't really an answer from free agency. Not sure if the Giants will get into that race (The Indians are reported to be interested though) and if not the Giants are going to have to make a deal as the only players on the roster that can play the hot corner is veteran utility infielder Joaquin Arias,minor league slugger Adam Duvall and Matt Duffy,who appears better suited for the middle infield positions as far as his bat goes. The Giants need another arm to slot in behind Madison Bumgarner,the returning from injury Matt Cain,Tim Hudson and Tim Lincecum. The Giants have been linked to Jon Lester,who would slot in rather nicely. The Giants are involved in the race for Cuban defector Yasmany Tomas,who is reported to be perhaps the best power hitter yet of the Cubans to hit the big leagues. Tomas will not come cheap and a signing of him and Lester might mean the Giants might have to try to get by at third with a bargain basement plan of Arias,Duffy, Duvall or a veteran signed off the scrap heap. Finally,we return to the signing front after I finally bought some plastic sheets! Thanks to Mike and Fred Landucci for the their work on the Harrisburg Senators team set and most notably A.J.Cole on his top 100. The Senators weren't loaded with prospects with the most notable being Cole and Michael Taylor. Fred and Mike also got two of my pile of Indians prospect Francisco Lindor finished and did the New Britain Rock Cats for me with the biggest catch being difficult signer Eddie Rosario on his top 100 and a few more. It was my last chance at the Twins because after the season New Britain switched to a Colorado affiliate. Thanks to Jason Christensen for our annual trade for the Binghamton Mets team set. The Mets weren't loaded with prospects either,but Kevin Plawecki is a nice prospect behind the plate. Thanks to Mike Oravec for his constant stream of TTM Indians,Pirates and Giants. My favorites of this flush is a 1972 of Jack Heidemann and a 1975 of former Buckeye Steve Arlin. A quick trip to Altoona with Kendall Morris for the Richmond Flying Squirrels saw me not have very much as the team set hadn't been released yet. Biggest catch was Kyle Crick on a few stragglers since Crick is down to signing two now. Kyle signed a Bowman and a baseball for me as well. I try to get the Pirates,Giants and Indians first round picks on baseballs for my collection. I also added former White Sox first baseman and Richmond manager Russ Morman on three cards as well.. The Wilmington Blue Rocks hit Frederick without a team set to do. The main gets were out of the Carolina League top prospect sets with Raul Mondesi Jr, Christian Binford,Sean Manaea and Miguel Almonte signing. Mike Landucci ran down to the field to get Bubba Starling on his top 100. The best story from this series came when this fellow came up to me and said he hadn't seen me since I was a little kid running around the bowling alley and talked like he really did know me. Turns it was Randy Thompson,brother of Wilmington hitting coach Milt Thompson. Randy brought Milt over to me and talked about me as a little kid.Maybe Randy really did know me!! The Lexington Legends were in Hagerstown for their visit without a team set due to the "Great Brandt Caper of 2014". As a result I had next to no cards for them other than Cody Reed and Chad Johnson of the SAL top prospect set. I did get Lucas Giolito and Drew Ward of the Suns on their SAL card and Brett Mooneyham on his Carolina League prospect card. The Winston-Salem Dash also had no team set for me to do as Brandt hit them as well. This mainly meant the Carolina League prospect cards of Courtney Hawkins,who always teases with me but signs-this time Courtney laughed and said "walk with me Bro". Others on the CL cards were Tim Anderson and Jacob May,Tyler Danish on his SAL prospect card and Brad Goldberg on his Elite card and the former Buckeye added Go Bucks on his card. Another quickie trip to see the Binghamton Mets with Kendall Morris saw me have little,but I did get two heritage cards signed of Brandon Nimmo,who is one of my favorite players ever,very nice and former Pirate prospect Dilson Herrera. Corey White came through with a shipment from Tennessee with the star being power prospect Kris Bryant on his USA card and top 100. I remove my top 100's as they come in and go in a different book,so I'll be doing a Top 100 review after all of this mess is finished! Corey also got me several Smokies with C.J. Edwards and Zeke DeVoss being the best. Corey also sent me cards from Huntsville (Brewers) and Mobile (Diamondbacks) with the best being Jonathan Griffin and Jake Barrett from Mobile.. The Frederick Keys team set came out and I did most of them during a meet the team day. Brandon Kline signed his Carolina League and Keys card with the other CL prospect card getting finished as well with Glynn Davis,Parker Bridwell and Adrian Marin. The Delmarva Shorebirds entered Hagerstown and DID have a team set. This was around the time that the SAL All-Star set came out and I got four Suns finished out of the set in Wilmer Difo,John Wooten and Nick Pivetta. The Shorebirds in the set were number one pick Hunter Harvey,Drew Dosch and Sebastian Vader. Harvey signed all three cards that I had and is nice,but quiet. 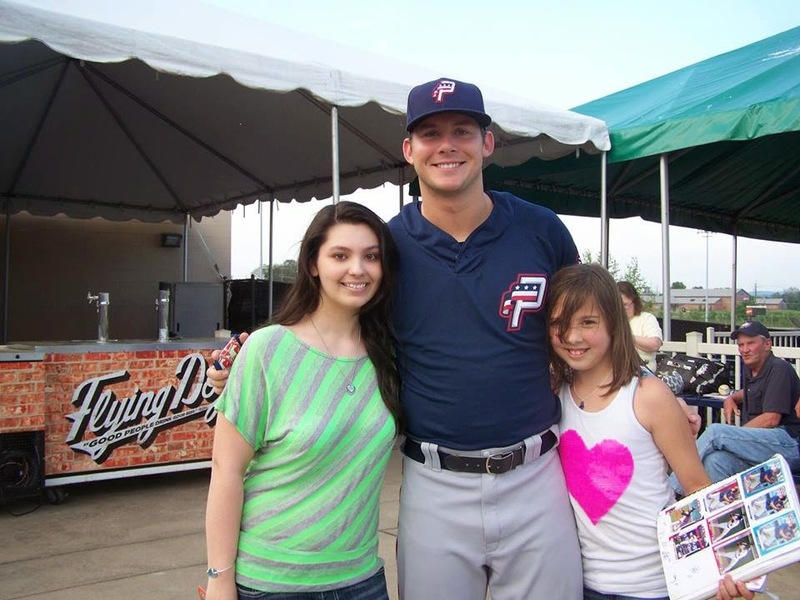 I took Rachel and Kayla to Frederick to see their hero Will Pinwica-Worms with the Potomac Nationals. No P-Nats teamer yet,so I had next to no cards. Still worth it though as Pinwica-Worms would get hurt before another visit to Frederick and then retire,so this was the last time that the ladies saw WPW. We squeezed in a shot at the Portland Sea Dogs with Kendall and Derreck in Reading for a pre-game appearance. The biggest catch was Brian Johnson on a few cards. I always seemed to miss Johnson in both Hagerstown or Frederick and it was nice to reel him in. I also added Luis Diaz on his Carolina prospect card and Deven Marrero on a Bowman Blue Wave. Marrero was down to just one card now,which was too bad as he was very accommodating in the past. More Red Sox as the Salem version rolled into Frederick. Some interesting guys this time as I added Madison Younginer,who I had tons of cards for along with Jose Vincio,who was injured the first trip in. Joe Gunkel signed his SAL All-Star card as did Jantzen Witte,but the most interesting was Mario Martinez. Martinez was a one time Mariner prospect and I was able to get cards signed from 2008 including a Appalachian League prospect. It is not often that you get a player signed from six years before in the Carolina League. Former Royals shortstop U.L.Washington was a Salem coach and came with a less than glowing signing record,but I did get him on an 81 Fleer and 81 Donruss. We wrap up with the Kannapolis Intimidators,who visited Hagerstown four times this year and due to the Brandt issues never had a team set available for those visits. A grand total of six cards for this series,but two of the always cool Pete Rose Jr including his 81 Fleer with his dad "Pete and Re-Pete". A mail success with former Alabama and B.C.Lions running back Johnny Musso. As large as this was,it barely put a dent in the pile. 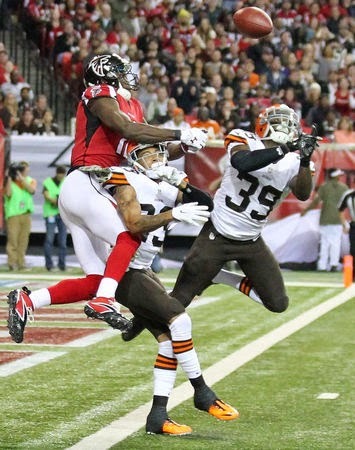 Billy Cundiff booted a 37 yard field goal on the last play of the game in the Georgia Dome and as a result,the Cleveland Browns moved to 7-4 with a 26-24 win over the Atlanta Falcons. Isaiah Crowell rushed for two touchdowns as part of his 88 yard rushing day,while Josh Gordon caught eight passes for 120 yards in the win. Brian Hoyer passed for over 300 yards,but was intercepted three times. 1) Josh Gordon made an impact in the return to the lineup with his statistics,but really opened things up for Andrew Hawkins,who grabbed 5 passes for 93 yards. If this is going to be how the benefit of Josh Gordon is going to be for the Browns,please keep Gordon as a model citizen! 2) Josh Gordon is the key to this offense. Look at the difference in the simple screen that saw Gordon bull his way up sidelines for first downs that no other Brown (and few other WR's in the league) can do. 3) Brian Hoyer was very impressive in the last drive that won the game for Cleveland,but boy was he bad for most of this game. 4) Many people have been critical of Josh Gordon for not leaping into the air on a bad Hoyer interception in the endzone,but looking at the angle that Gordon was on,I'm not sure that Gordon could have deflected the ball,even if he had leaped. Hoyer threw a bad ball and tried to thread a needle that the smarter play would have been to throw the ball into Stone Mountain..
5) Isaiah Crowell ran for his yardage on just twelve carries and in my opinion,Crowell continued to prove that he is the better back than Terrence West,who was OK himself with 62 yards on 14 carries. Crowell runs hard and looks the part of a workhorse back,if the Browns only give him the chance..
6) Other than one touchdown catch,Joe Haden did a pretty good job keeping Julio Jones under control. Haden might have had the best game of the year and did it against one of the better pass catchers in the game..
7) Looks like the Browns sustained a huge loss in the league leader in interceptions as Tashaun Gipson might be out for the season with a knee injury suffered late in the game. 8) Mike Pettine did a poor job in clock management late in the first half,but the worst decision almost cost the Browns the game. 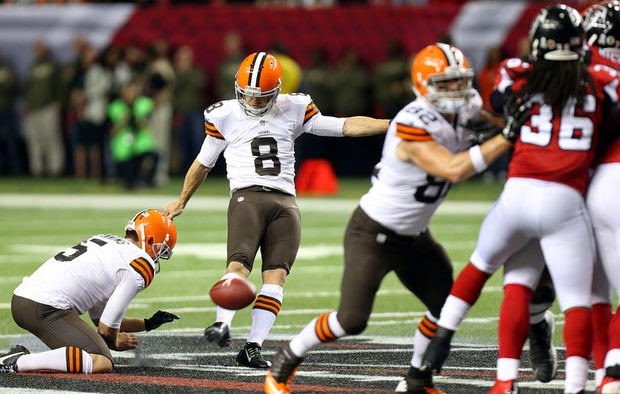 Billy Cundiff does not have a huge leg,yet Pettine tried a 60 yard field goal that Cundiff was well short on. However,Atlanta had called a timeout,so having seen that Cundiff could not get the ball there,one would think that you could have Brian Hoyer put the ball up and hope Josh Gordon could come down with it. Instead,Cundiff was told to try again and again was short,but this time Devin Hester was waiting and he almost took the ball back for a score. Joel Bitonio hustled downfield to make the tackle,but Spencer Lannig slowed Hester up to buy Bitonio time to make the play. 9) Atlanta made some silly decisions too on their final drive that saw Matt Bryant kick a field goal that gave the Falcons the lead on back to back plays. Smith called a timeout after second down and then called a pass to Devin Hester on 3rd and 2 that Justin Gilbert knocked down. Right there saved two timeouts that Cleveland would have likely used and then would have had just one timeout left for their final drive. 10) The best play of the game was made by Paul Kruger,who pressured Matt Ryan,forced him to step up in the pocket,fell to the turf and then got up hustling to sack Ryan anyway! Kruger was the key signee of 2013,but it's 2014 that the linebacker has begun to pay huge dividends with two sacks yesterday and eight on the season. 11) Just a thought and it may not be one that can be made,but assuming Tashaun Gipson is out for the season,what about Justin Gilbert moving to safety? 7-4 with a winnable game against Buffalo at a neutral site. I don't take any game as a W as a team with losses to Houston and Jacksonville cannot afford to do that,but let's say they win and it's 8-4. That leaves four games-two at home vs the Colts and Bengals,two on the road vs the Panthers and Ravens. Beat Buffalo and split the final four,10-6 might be good enough to get them into the playoffs and who saw that coming? Sloppy Buckeyes slide by Indiana 42-27,Clinch Big 10 East! The Indiana Hoosiers hung tough with the Ohio State Buckeyes for three quarters before Jalin Marshall atoned for a bad week in Minnesota with four straight touchdowns to lift Ohio State to a 42-27 win over the Hoosiers at the Horseshoe. Marshall grabbed three touchdown passes from J.T. Barrett and returned a punt for a score to lead the Buckeye rally. Barrett finished with 302 yards and four touchdowns,although he was intercepted twice. The Buckeyes improve to 10-1 with the victory and 7-0 in the Big Ten East as the Buckeyes clinched the division title and representative to the Big 10 title game in Indianapolis. Next Saturday,Ohio State hosts michigan in what is likely to be Brady Hoke's swan song as coach. The punt return cracked the game,but the one handed catch pictured and two shovel passes caught killed the Hoosiers. Just hold onto the ball,Jalen and special things happen. 2) J.T,Barrett got two TD passes that were closer to runs,but he got an interception that he didn't deserve either deep in Indiana territory as a good pass was deflected into Indiana hands. Barrett wasn't terrific,but 400 yards of total offense sure is Ok with me..
3) Ezekiel Elliott scored the first touchdown on a 65 yard run,but only carried 12 times after that. Sometimes Tom Herman forgets about the running game and against the undersized Hoosiers,pounding the ball more might have blown this one open sooner. 4) Give punter Cameron Johnston a game ball with three of his five punts dying inside the 20. Great job punting with one ball literally causing a divot in the ground at the one yard line. Johnston punts in the NFL one day-bank on it..
5) The run defense continues to have problems as Tevin Coleman rushed for 228 yards and three scores including a 90 yard run. Pacquiao dominates Algeri and Boxing Challenge! 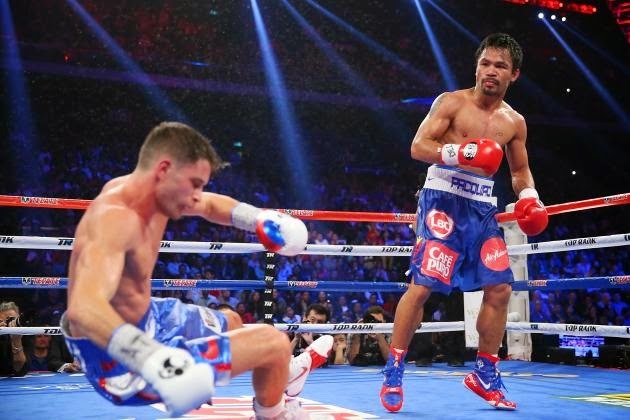 Manny Pacquiao dropped the undeserving (Yeah,I'm still mad he robbed Ruslan Provodnikov!) Chris Algeri six times and cruised to a unanimous decision to retain his welterweight title without a lost round. I didn't watch any the PPV fights since I was at the road office,so my opinions aren't added to the results of the boxing challenge. The challenge got even tighter as I gained one point on R.L.Malpica on the evening. Each of us earned one point for the Pacquiao victory as both of us had seen a Pacquiao stoppage. We each earned two points for Jessie Vargas's unanimous win over Antonio DeMarco and two more for Zou Shiming's win over Kwanpichit Onesongchaigym. R.L earned two points for Vasyl Lomachenko's unanimous win over Chonlatarn Piryaipinyo,while I picked one for the win as I thought Lomachenko would win by KO. The difference maker? Tony Bellew's split decision win over Nathan Cleverly in England. I had picked Bellew by a split nod and R.L. took Cleverly by a split win. That gives me eight points on the day and R.L. added seven points to close the gap for the season,which is just a month away from ending. R.L.holds a slight 69-68 margin with plenty of boxing coming up in December! I still have the Ohio State recap to do and if I have time I'll get that finished. If not,look for a double barreled post tomorrow on Buckeyes and Browns. For one period,the Cleveland Cavaliers showed what they are capable of as a combination of excellent ball movement and shooting allowed Cleveland to build a lead as large as 18 points and a 13 point lead at the end of the quarter. 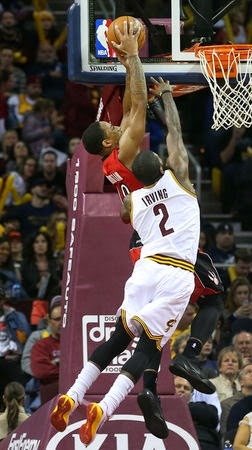 One man changed that as Lou Williams of the Toronto Raptors caught fire and to most peoples surprise,it was Toronto that led at the half and then dominated the third quarter and rolled on to a 110-93 victory over the Cavaliers at Quicken Loans Arena. Kevin Love led Cleveland with 23 points and Kyrie Irving added 21 in the loss. 1) The man that caught fire was Lou Williams,who finished with 36 points off the Toronto bench with an amazing 15 of 15 from the line. The career high for Williams is part of the game as occasionally you will see someone that looks at the basket as the Atlantic Ocean (or Lake Erie in this case) for an evening and it's tough to stop. 2) Kevin Love did seem a bit more comfortable in the offense,which is a piece of good news in this one. Love shot 8 of 16 on the game,but the tipper for me was this-only one attempted three pointer. Love looked to get better shots in the low post and was able to take advantage of them off the block. James finished with 15 points (6 of 12 shooting),but with 10 assists. Shoot more and he isn't involving the teammates more,Pass more and he isn't doing his part offensively. 4) However,it has become apparent for the time being that if the Cavaliers are going to win games,the offense needs big scoring numbers from LeBron James. When James does not score and works more off the passing games,Cleveland generally loses. Now,I understand that there is a need to tune things ups and I'd rather win games in May than November,but keep that in mind. It's actually seven (five starters,Dion Waiters and Tristan Thompson),but it is still a valid point. David Blatt waits too long to unload the bench,wastes tread on games early in the year and needs to either find something off the pine or hope that David Griffin can do something to help a unproductive group. 6) Dion Waiters is playing pretty poorly. Waiters scored just six points over 20 minutes of play and commented after the games that he "likes to have the ball in his hands more". Looking at the composition of this roster,that simply isn't going to happen. The problem is that with him playing so poorly he is losing value for a possible trade. 7) Jonas Valanciunas scored eight points and added just five rebounds for Toronto,but just looking at his low post game and body on the block makes me wish the Cavaliers had taken him,when most expected them to,instead of Tristan Thompson. Valanciunas had a third period run of a putback rebound for a score,a blocked shot on Kevin Love,a short jump hook over Love and then a rebound to set up a fast break. I really like Valanciunas coming out of the draft and thought they should have taken him then (I'm not perfect,I liked Derrick Williams over Kyrie Irving in the same draft due to Irving's injury issues). The Boxing Challenges continues tonight with a PPV card from Macau China and a bonus bout from Great Britain. The Cleveland Cavaliers dropped below .500 with their third loss in a row,this one to the Washington Wizards 91-78 in Washington. LeBron James and Kyrie Irving each scored 22 points as the top scorers for Cleveland. 1) What an awful evening. 36 percent from field,6 of 27 from three point range. 2) What an awful evening. Allowed 49 percent shooting to Washington,showed a general lack of interest on the defensive end and few showed the mildest effort in a comeback when Washington went stone cold in the fourth quarter. 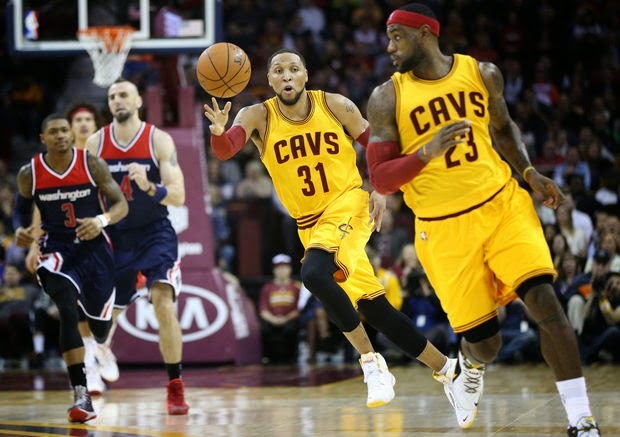 3) The Cavaliers played the Wizards even in the second half,but that didn't make the offense any better. 4) Kevin Love is struggling. You knew that already,but tonight it was glaring with Love hitting the magic eight ball. 8 points,8 boards and 8 shots from the field. Love looks lost in the flow of the offense and has begun to get into the habit of floating around the three point line,looking to launch three's. The problem with that is that it then takes him out of position to rebound. As always there will be expected growing pains,but this is going to need to be fixed. 5) The Cavaliers did not receive one point from the bench until just under four minutes to go in the third quarter and finished with just nine points on the night. Tristan Thompson with four,Mike Miller with 3 and an especially bad Dion Waiters,who scored two whole points in 22 minutes of play! 6) What a waste of time of watching. I can excuse losses and on the road to a good Washington team,that's excusable. I recently was talking with Rachel during a Devils game and she commented that the Devils didn't fight nearly as much as they used to. That's true and all of the anti-fighting crowd should be happy that fighting has drastically decreased over the last two years. The lovely Cherie has thought for years that fighting was not a need in the game and always complained about it. Me? I rank Bob Probert among my favorite players ever and used to trade for fight tapes of my favorite bombers,so I was not a fighting snob. I loved Devils fighters of the past like Krzystof Oliwa,Troy Crowder,Ken Daneyko and more. The NHL was always an easy mark for columnists looking for a topic to bang some words out and were able to rant about the ills of the bouts with outrage. If you have a player that can defend himself and can perform at a level that the game demands,then the fighting is a bonus,but the less than skilled Darren Peters,Eric Boulton and Kris Barch types are being run out of the game because they simply cannot compete in the current game. The skating and scoring simply overwhelm the the physicality and as a result-the enforcers are almost useless on even a fourth line with limited duty. You can argue that is not as fun of a game to watch,but until someone is able to to be successful in a attempt to build a roster based on players that are able to whack around the skill players,the game is what it is for the time being. The main issue is one that is affecting other sports as well-brain issues. 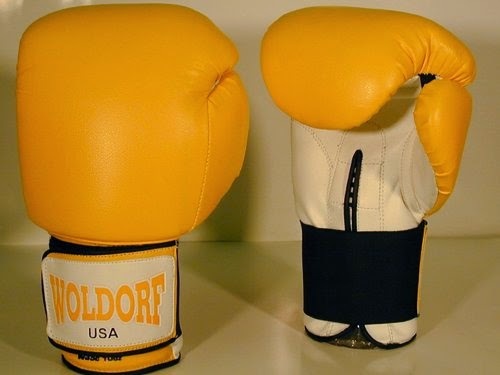 Unlike boxing,the fights on the ice result in gloves being dropped,not being put on. Hockey fights often are muddled,sloppy,grasping bouts,but the the danger is not always the bare fisted fighters-it's the ice from when they hit the ground. Thick,frozen ice with no give can cause severe injury when heads hit the surface without any padding and from the force that is created from falling out of control. Now that we are learning more about brain injuries,I can see the value of less fighting,although I still believe that the game suffers from losing it as the players now are able to cheap shot more and not pay a price for their dirty play,but if it means a better post-hockey life for the players-I can live without it. Until then-there is always my old fight tapes as I transfer them to DVD. 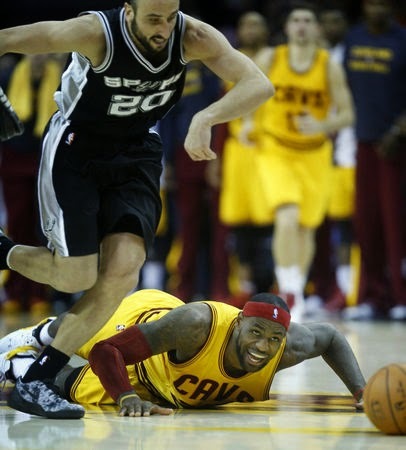 In a game that was the type of encounter that you expect to see in the playoffs,not in November,the defending NBA champion San Antonio Spurs held off the Cleveland Cavaliers 92-90 in Cleveland. Anderson Varejao led Cleveland with 23 points and 11 rebounds in the defeat. Cleveland drops to 5-5 with the loss. The Cavaliers travel to Washington on Friday against the "Bullets"
1) Huge night for Anderson Varejao,who's double double kept the Cavaliers in the game. Varejao played with reckless abandon with floor burns and bumps. The only concern is how long can the "Wild Thing" hold up flying around like that considering his past injury problems? On this night,Varejao was the best Cavalier. 2) LeBron James did dribble the ball off his foot at the end of the game,but these things happen. James is being paid to be the guy with the ball at the end of the game and no one succeeds every time over the course of a season. Yes,it was a failure this time,but James is the alpha dog-I'd rather him have the ball than not. 3) Kyrie Irving finished with 20 points,but just three assists. Some of that can be that guys missed shots,but I'm still seeing way too much score first,pass second from Irving. 4) Kevin Love was shut down by the Spurs,who used various forwards to keep him away from the basket and gave few open looks..
5) I've always pulled for the Spurs as an old ABA team and as a huge Tim Duncan fan going back to his days at Wake Forest,but even beyond that-you have to love team basketball. That's what won this game over Cleveland and that is what beat LeBron and Miami. San Antonio uses role players better than anyone to surround their stars and few find better nuggets in the draft than the Spurs. 6) Gregg Popovich is my second favorite NBA coach next to Larry Brown in years. I love his style and I love his cranky,ticked off demeanor in those NBA mandated interviews. Check this close to the point interview from last night. Chris Broussard;Rambles about the 1st quarter play of Tim Duncan for 30 seconds,asked for a response. Popovich;Looks mad and impatient and replies disgustedly;"He's playing good"
Popovich: Looks angrier and say "Playing good" and moves along. I used to hate being bothered in youth baseball games,I can imagine doing these things in professional games! 7) This is the type of hard noses,well played game that you like to see in a league with the reputation of mailing in some regular season games. This was post season style basketball level and even though Cleveland lost-It was an enjoyable time to spend just watching the game. The Cleveland Browns released unhappy running back Ben Tate in a move that would have been a surprise a month ago,but now seemed to be a move that was going to be inevitable. Tate was the biggest signing of the offensive side of the ball for the Browns,but had struggled over the last month with the zenith being a -9 yards on two carries and a chop block penalty against his former team in the Houston Texans. Tate was off to a strong start in the opener against Pittsburgh as he ran for 41 yards on six carries before suffering an injury that would sideline him for a month. Tate's return saw his only 100 yard game as a Brown as he ran for 124 yards in the Browns comeback win over Tennessee. The highlights were slim after that game in Nashville as only his 78 yards and two touchdowns in the win over Pittsburgh would ever exceed the measly total of 36 yards thereafter. I've written that much of the problem with Ben Tate is that he was having trouble being able to turn the corner on sweeps and pitches. I still think that Tate can be an effective runner,but I think he will need to be given runs between the tackles to loosen the defense for those occasional outside runs and he will work best as the main back to wear down the defense. Tate splitting time with Isaiah Crowell and Terrence West was not going to give that opportunity to Tate,so this release might be the best thing for all parties involved. The Browns can be rid of a player that clearly was becoming a malcontent,Crowell and West will each get more carries with the football and Tate is rumored to be on his way to the Colts,who need a back with the season ending injury to Ahmad Bradshaw on Sunday. 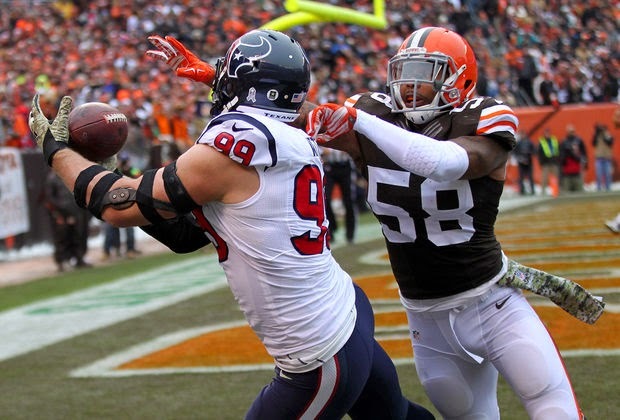 Cleveland also re-signed former Texans linebacker Zac Liles to a contract to address depth after the losses of Jabaal Sheard and Karlos Dansby. A listless New Jersey Devils team started their four stop start to their Western Canadian swing with a dull effort than ended in a 3-1 loss to the Winnipeg Jets. Patrik Elias scored the only Devil goal (2 power play) in the final period to cut the lead to 2-1 before the Jets last goal put the game away. I just don't know what to say more than that. 2) Penalty kill still developing,but killed off five penalties without a goal. A positive there,especially when you look at the five on three kill. I hate to look at just one factor when scanning team numbers,but you just cannot escape that these numbers changed when Bryce Salvador left the lineup. 4) Patrik Elias continues to show life with his first goal since the opener in Philadelphia. 5) Adam Henrique returned to the lineup,but didn't make visible differences in play. 6) Still have that Devils look at the team's future planned. I just need to have the time to knock it out. The Cleveland Cavaliers showed that teams will have good nights and bad nights and sometimes they can be extreme from game to game as the Cavaliers were flat i a 106-97 loss to the Denver Nuggets in Cleveland. LeBron James led Cleveland with 22 points and Kevin Love added 20 points with 11 rebounds in the losing effort. 2) Cleveland received 20 points or more from each of these four players-LeBron James,Kevin Love,Kyrie Irving and Dion Waiters and received 15 total from the remaining five players with PT in this one. When two of those are starters (Shawn Marion 7 and Anderson Varejao 0),you will not win many games..
3) The player of the game tonight was in the visiting blue and yellow as Ty Lawson dominated his matchup with Kyrie Irving and put aside the numbers (24-20 pts 12-8 assists),which make the duel far closer that it was. 4) Kevin Love was sharp early,but disappeared in the second half. 10 of Love's 20 came in quarter one and rarely shot in the second half. The Cleveland Plain Dealer points at Love being a big man that is dependent on the passing of his teammates and that's true to a degree. However,Love is a star and there is nothing wrong with him or David Blatt for that matter stepping up and demanding someone to get him the ball. 5) Dion Waiters shot the ball well (9-16) and during one run was the entire Cleveland offense,but still shows defensive issues as he had big issues guarding Aaron Affalo. 6) Latest Cleveland rumor? Obtaining Corey Brewer from Minnesota. Brewer brings more defensive skills to the team,but is not the scorer that some are. The Cleveland Browns apparently cannot stand prosperity as for the second time this season,the Browns played a bad game after a huge win. This time,the victor was the Houston Texans,who came into Cleveland and handed the Browns a 23-7 defeat. Brian Hoyer threw for 330 yards,while Andrew Hawkins and Taylor Gabriel each went over 90 yards receiving on the day. 1) J.J. Watt might be the best player in the game. Watt caught a touchdown pass against our best coverage linebacker in Christian Kirksey,abused Mitchell Schwartz all day in harassing Brian Hoyer and was clearly the best player on the field. 2) Watt apparently is not great on the punt rush as he roughed Spencer Lanning twice,with one of those keeping the only Browns scoring drive of the day alive. 3) Brian Hoyer's numbers look great,but I didn't think he played well. Hoyer continues to frustrate me with inaccurate passing and I have a feeling that the problem is going to get worse as the weather increasingly gets colder. I know Hoyer is a local Clevelander and all that, but wind carries the ball. If you aren't accurate in prime conditions,how can you expect it to improve? 4) Isaiah Crowell was the surprising starter and was OK with 61 yards,with a long of 35 yards. Crowell did fumble on a drive,but that was not sloppiness,it was just an excellent play for the Houston defender. 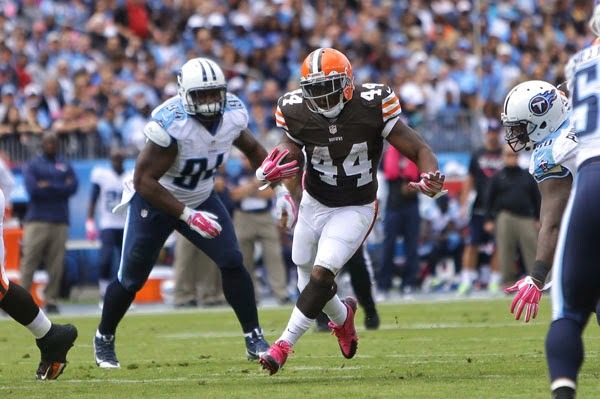 5) Ben Tate likely will be gone as a Brown at the end of the season. Tate was given two rushes for -9 yards against his old team and rarely saw the field. There was likely not a game that he would be more motivated for all season and the Browns didn't use him. I'm not saying that he would have been productive,just that he would have been at the top of his game as far as effort. 6) Huge loss to the defense with the departure of Karlos Dansby,who will undergo an MRI on his knee today. IF Dansby is out for the year,which is possible, and the loss of Phil Taylor on the defensive line,the Browns defense is in huge trouble against the run especially. 7) I didn't see Justin Gilbert one time yesterday. 8) The Browns allowed over 200 yards on the ground with 156 to Alfred Blue and that's not going to get things done on the scoreboard. The run defense regressed in this loss and if the defensive losses are long term,this will continue to be a problem. 9) Special teams is still a problem as Billy Cundiff missed a field goal and an awful snap eluded Spencer Lanning and only a great run and kick from Lanning avoided a huge disaster. That doesn't even count the kick return TD of Marlon Moore that was called back on a holding call. 10) Miles Austin dropped a few big passes in the 4th quarter,but everyone can have a bad game,so I can excuse things for one week. 11) If you would have told me that the Browns would be 6-4 without Josh Gordon,I would have taken it,but there is something that is disappointing. Two losses to awful teams offset division wins and for all the numbers,I'm disappointed in the offense. The Cleveland Cavaliers set team and league records for three point efficiency and routed the Atlanta Hawks 127-94 at the Q. The win was the fourth in a row for the now 5-3 Cavaliers. LeBron James led Cleveland with 32 points with Kyrie Irving tossing in another 20 in the blowout that allowed the Cavaliers to empty the bench and fans to see some of the players that they had not seen this season to date. 1) 19 three pointers.Franchise record! 2) First eleven three pointers hit-,nine in the first quarter-NBA record! 3) Eight different players drilled threes with LeBron James,Kyrie Irving and Joe Harris each knocking down four! 4) 71 first half points! That's a lot and scoring like that allowed David Blatt to clear the bench and save some wear on the starters. It's a long season and any time that you can rest guys-you should. 5) 39 assists on the night.Just read that number and you could see that the Cavaliers are beginning to progress with the David Blatt system. Ball movement means easier shots and that is how teams can pile up assists. 6) Atlanta has been a team that seems to tinker with colors,logos etc through the years as they are always seeming to be looking to build a fanbase,which they have been trying to do since I was a kid. 7) Finally,after three blogs this morning (whew! ), last night's game was one of those that make you think that this team could be really special. Things won't click like this every night,but when they do-the results will be devastating for the opponents. That is why I'm keeping every game this year on DVD,It's going to be a special season! With just under eight minutes to go in the game,the New Jersey Devils appeared to have the game in hand against the Colorado Avalanche with a 2-1 lead and the Avalanche retreating offensively. One extremely soft goal and one borderline (mushy?) goal later,the Devils were left with no points on the night and holding a 3-2 defeat. 1) Big dog in the house-Cory Schneider's play in the third period. The goal that tied the game was extremely soft as it trickled through. No way in hell that puck is on anyone other than him. 2) I've tried to be very fair in covering Cory Schneider because he is in a difficult spot of replacing a legend. Devils fans are so torn as some fans defend his every move ( some other sites and fans) and others cannot stand the guy (Rachel) for replacing Brodeur/behaving in a less than classy manner last season with the result being anything short of a shutout displeases that sector. Here is my problem-I want to like Schneider,but his play has not justified the contract on a consistent basis. 3) The final Schneider note.He has played in every game. Another knock on Brodeur was the wear on him playing all the time and here is Peter DeBoer doing the same thing to Schneider. What was the point in recalling Keith Kincaid from Albany,if he is just going to sit around? 4) Patrik Elias assisted on both Devil goals showing that perhaps his game is waking up a bit. I could say it is the return of Martin Havlat and maybe that's the case,but it seems that Elias has lost a step and is still adjusting to the change in his game. 5) The Devils continue to improve on the PK as the team killed off all penalties including a four minute one. Funny how the absence of Bryce Salvador has done that,isn't it? J.T. 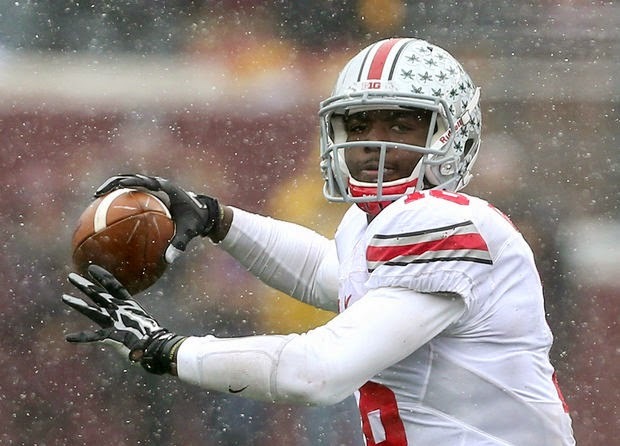 Barrett threw three touchdowns and ran for another as the Ohio State Buckeyes survived snowy conditions to defeat the Minnesota Golden Gophers 31-24 at a cold Minneapolis. Barrett's 86 yard TD run was the key chunk of his 189 yards on the ground and Barrett added another 200 through the air. The now 9-1 (6-0 Big 10) Buckeyes will return to the Horseshoe for their final two games of the regular season-next week vs Indiana and the following Saturday vs that team up north. 1) J.T. Barrett is slowly winning me over as a Heisman candidate. 2) The Barrett run was the longest TD run for a quarterback in Ohio State history and his 189 yards rushing was the most ever for a OSU quarterback. For the first time,I'm starting to lend a little credence to the idea of Braxton Miller transferring someplace for next season. I'm not sure that even Urban Meyer can pull off a system that is going to make two quarterbacks of this quality happy..
3) This game was not that close. Two turnovers basically handed Minnesota field position for two touchdowns and even when the score was close,which during two different times-I never had that feeling that the game was slipping away,..
4) Jalen Marshall is going to be a big time playmaker,but he is going to have take better care of the ball. Marshall was fast and loose with a fumble off a catch just before he scored and caused a touchback and later fumbled a punt that gave Minnesota a short drive for a TD. 5) The cold and snow had its share in the game,but didn't seem to be overwhelming. 6) The run defense still concerns me as David Cobb rushed for 145 yards and three scores. Cobb is a good back,but not the type of back that Ohio State is going to face in Indianapolis in Wisconsin's Melvin Gordon. That needs to be shaped up and soon. 7) Another key play was early in the third quarter when a touchdown off an interception was called back for a pass interference. The Minnesota receiver was falling down,but the defender did have a hand on him. Even in the Big 10,if Minnesota can ever get their program to the top,that stadium is going to be quite an advantage. 9) Joey Bosa bounced back from a tough day in East Lansing with seven tackles and a sack. Bosa did have a knee brace,but it didn't seem to affect his any.. The question becomes how much do they jump? Minnesota sliding into the ratings last week at 25 will help a smidgen in the quality win category and the late night loss by number six Arizona State will guarantee one spot. Cavaliers steal one away in Boston! After one of the worst quarters of basketball that you could expect to see,the Cleveland Cavaliers trailed by 17 points amid a terrible quarter of defensive basketball,I was ready to type a less than glowing report of "growing pains" and "processes". However,those will wait for another night,as the Cavaliers destroyed the Boston Celtics in the fourth quarter and stunned the fans in Boston with a 122-121 shocker. 1) LeBron James and Kyrie Irving stepped up in the fourth quarter and simply refused to lose. 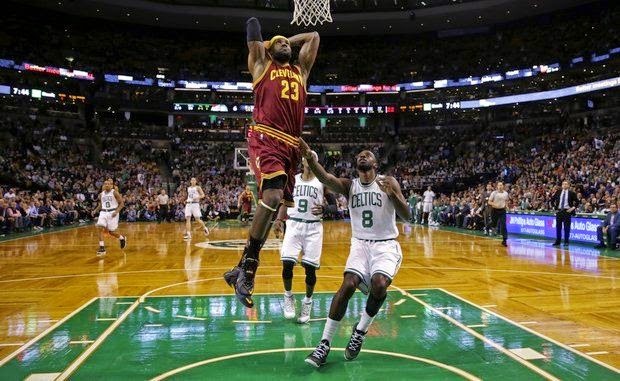 The pair outscored the Celtics 25-20 in the fourth quarter and took over the game. 2) Kevin Love may have struggled with his shot (2-10 from the floor),but he still had a nice night on the boards with 15 grabs and zipped off one of those long bomb outlet passes to LeBron James for a huge uncontested slam. 3) Anderson Varejao scored 16 points to make up for Love's rough shooting. Varejao hit seven of ten shots in the win with hooks low in the paint. 4) The biggest question entering the season was defense and its been warranted. The defense in the third quarter was weak and it is pretty clear to me that the Cavaliers aren't finished tinkering before this season ends. There is no shot blocking threat and no one to keep the paint clear from invaders. 5) Dion Waiters returned to the court with 10 points in 17 minutes,but Joe Harris played more minutes with six points. 6) Disappointing night from Tristan Thompson,who scored just four points and was part of the bunch that allowed those uncontested drives down the lane. Cleveland will need more than that from Thompson. 7) None of the comeback matters if Rajon Rondo takes the shot at the end of the game. Boston had a chance to win with their best player having the ball in his hands. Cammalleri Capitalization give Devils Washington Win! Mike Cammalleri grabbed a bad clear of the puck by Washington's Braden Holtby and fired it into the net before Holtby could return to the crease in the third period as the New Jersey Devils defeated the Washington Capitals in Washington 1-0. The goal was the seventh of the season for the veteran and allowed the Devils to slide out of Washington with two points. The Devils finish the back to back games against Colorado at the Rock on Saturday. 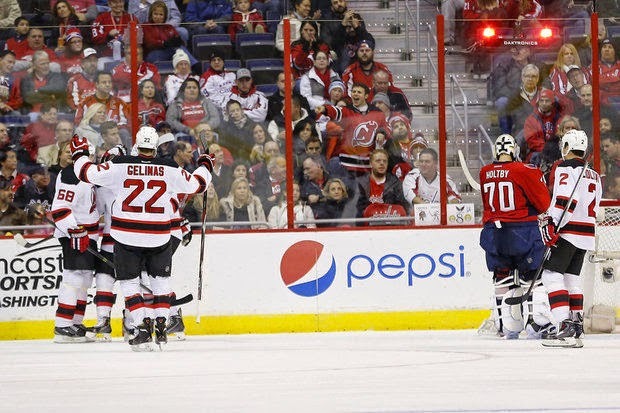 1) The game winning goal by Mike Cammalleri was very similar to the miscue that bedeviled Cory Schneider on the only goal allowed by the Devils against Minnesota. When your goalie goes out of the crease to play the puck,he had better play it and play it hard. The slightest error can cost you and this one gave the Devils two points..
2) I have to admit that as I wrote about Mike Cammalleri's signing that I had concerns,but when he is healthy (and already that has come up),he is exactly what this team has lacked-a sniper that goalies have to respect. Cammalleri has also been the clutch scorer that the Devils didn't have last year as three of his seven goals have been game winners. 3) Cory Schneider had his second strong game in a row with 30 saves. 4) The Devils went back to playing old school "Devils Hockey". Very defensive minded and taking few chances. 5) The penalty kill improved with a perfect four for four night in killing off penalties. Nice to see that hopefully be the beginning of a turnaround. 6) Something to look at for the future-the Devils did kill off the six on five at the end of the game,but missed an opportunity to put the game away with Marek Zidlicky missing the open net. The PPM returns this week after a less than strong last week. A.J. Burnett returns to Pittsburgh! A,J, Burnett will be returning to Pittsburgh on a one year contract worth 8.5 million,which isn't cheap,but doesn't look as hefty as the 12.75 million option that Burnett could have exercised to stay with the Phillies. Burnett took the lower paycheck (somehow I feel pretty good that his bills will get paid though) to return to Pittsburgh after turning a Pirate offer last off-season down to spend 2014 on the eastern side of Pennsylvania. Burnett went 16-10 in 2012 with an ERA of 3.51,but pitched even better in 2013 with all of his numbers improving except for wins. Burnett wanted a sizable raise and got it from the Phillies on a one year deal with a mutual option (which both declined) and a lower player option (which as noted Burnett declined). Burnett lost a league leading 18 games as a Phillie and his numbers increased as well,although I attribute some of that to the more hitter friendly park in Philadelphia. Burnett did continue to show his durability as he again pitched over 200 innings and despite his 37 years of age,looks to be a reasonable bargain in a return to a pitchers park that he has had success pitching in the past in,. A very reasonable contract for both Burnett and the Pirates made this deal as a cost effective contract from the Pirates point of view and one that Burnett might be able to build upon for another one year deal from the player's side of things. 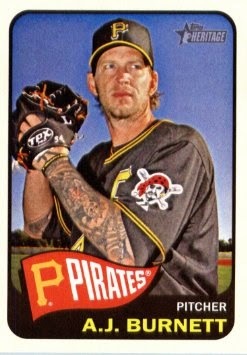 The Pirates needed a workhorse to slot into the rotation,A.J. Burnett wanted to give himself the best possible chance to finish his career on both a contender and in a town that he is comfortable being in even at a lower paycheck. On the surface,it is a winning deal for both side and I'd feel pretty good about bringing in along with the cost of A.J. Burnett. 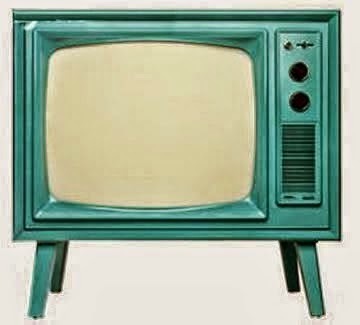 After two months,I figured it's time to go back and give a report on the five new shows for this TV season. I haven't seen every episode as shows lose out if both the Cavaliers and Devils play on the same night,but this makes the cut. I don't watch the other NCIS family shows,but Scott Bakula carries the show well as the lead and with two appealing co-stars in Lucas Black and Zoe McCellan,this show is likely a ratings winner and regular in my lneup. My favorite of the winners from this season,Gotham is the prequel to Batman and does a good enough job in hooking you into reading between the lines of how the villains develop into well villains/. Long time favorite Donal Logue is terrific as Harvey Bullock in a supporting role,but the real surprise comes with a very minor character in Cory Michael Smith's portrayal of the eventual Riddler. This Riddler has the potential to be the most loyal to the character since well..ever. It's pretty formulaic as a political show goes,but as you might have expected from reading my preview,Tea' Leoni makes the show worth watching. TV veterans Timothy Daly,Zeljiko Ivanek and Bebe Neuwirth give the show a solid casting start with room to grow,but the younger characters will need to develop. Not a bad show,but nothing out of this world. Scorpio is just kind of bland. Nothing terrible,but nothing exciting either. The team lacks a character that clicks with the audience and there just isn't a lot of connection. Forever was a strict "tape"show anyway as it's time slot put it up against long time favorite Person of Interest. It took about three episodes to lose interest in the premise and the characters didn't make you care about them or their story. Forever looks to be one of the first casualties of the season,so I am not the only one that felt that way. Pirates trade for another Yankee catcher?! Cavaliers top Bulls 114-108 in Overtime!